The markets for Border and Internal Security UAVs will surprise you. Market Forecast new “Global Unmanned Aerial Vehicles (UAV) for Border & Internal Security Technologies and Market Forecast to 2025” report explains how. Unmanned Aerial Vehicle forecasts typically claim that spending increases steadily forever. That’s the case with Border and Internal Security UAVs in some regions but not others. Those markets declined significantly in North America, Oceana and, to a lesser degree, South America when experiments with expensive UAVs patrolling borders mostly failed in those regions. The rich nations that flew expensive UAVs did not expand their border UAV programs and others are now using much smaller aerial vehicles. We’re also approaching a period of no growth as fleets fill up and the markets reduce to maintenance rather than large acquisitions. Central Asia and South America will account for over half of the world’s Border and Internal Security UAV market share. Those regions will also show much more spending and much more growth than Europe or North America. All of that is without the shock of a successful cross-border terror attack. If that attack happens and results in a rush to deploy UAVs, you can expect $826 million in UAV spending in the next year for South America but only $82 million for the same year after an attack in North America. There’s also a significant difference between the ways that nations see border and internal security. Those nations with strong individual privacy rules, such as in Europe and North America, do not use government UAVs for internal security. That doesn’t mean they won’t use them for law enforcement, which is an entirely different topic. But they won’t buy UAVs to monitor their own citizens and don’t allow their border UAVs to look into their countries. Most other nations see little difference between security inside their territory and on their borders. They often have one security structure for both. The result is entirely different regional markets based on those truths. Market Forecast’s new report includes that critical distinction. It also includes two scenarios that are each explained by region: one is today’s reality and the other is a regional forecast on how today’s market will change after a significant terror event launched across a border. The market news is good in some regions. This new report tells you which ones and why. South America and Africa will lead the world’s regions in growth of the Border and Internal Security UAV markets. ASDMedia’s new “Global Unmanned Aerial Vehicles (UAV) for Border & Internal Security Technologies and Market Forecast to 2025” report explains how. UAVs seemed destined for a lucrative future along rich nation borders when the US and Brazil deployed very expensive, high altitude machines like Predator and Heron nearly ten years ago. But that promise failed when those experiments in border security did not prove cost effective. The gathered intelligence also did not assist border security agents in the way they expected. But the news is much better for less affluent nations using cheaper UAVs. The African, South American and East Asian regions will continue to see steady growth of about 8% CAGR each through the end of this period, with much of that spending occurring early. They bring the global CAGR up to 6.8%. 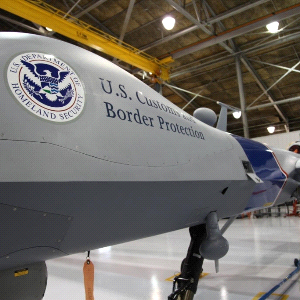 This report details each region along with how to sell border security UAVs in today’s market. Will terrorists strike the United States or European Union nations across their patrolled borders? Certainly, it’s only a matter of time before the terrorists finally manage to evade those border defenses. When they do, the border security UAV market in the affected region will more than double in a year. That’s one conclusion detailed in Market Forecast’s new “Global Unmanned Aerial Vehicles (UAV) for Border & Internal Security Technologies and Market Forecast to 2025”. The North American market, for example, will jump from about $30 million to about $82 million if that attack occurs in 2018. Likewise, the European market will jump from about $253 to $557 under the same conditions. This report forecasts in two scenarios; today’s steady state and regional forecasts if such a successful terror attack occurs. Read it and you’ll be ready to capitalize on demand either way.